The Merced Apartment Dois is a modern apartment located at the heart of the city, few meters away from the main attractions and activities. It can accomodate up to 4 people. It offers one bedroom with twin beds pushed together. It is located in the same building as the Merced apartments U, Trois, Four, Cinque et Zes. - 1 livingroom with a sofa bed for 2 people. A 16.49% of total price is charged on your credit card for all reservations. A damage deposit of 150 € will be guaranteed by your credit card or paid in cash. In case you want to store the luggage in the apartment later than 12:00 you must call us the day before your exit day and we will let you know if it is possible. The apartment Merced Dois is located in Old Town area. This apartment is located in one of the best parts of the city. Just 50 meters from the Town Hall Square in the heart of the city-center, between the famous Barrio del Carmen and the most fashionable shopping area in Valencia. Do not forget the variety of restaurants and touristic life, as the main monuments are located in this area. For example, the Silk Exchange Building - Unesco heritage . A pleasure . 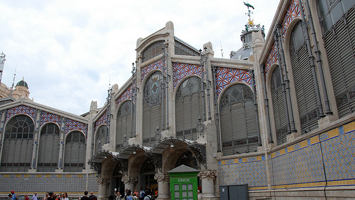 Nearby is the highest concentration of museums, theaters and culture of the city . Staying in the building of the Plaza de la Merced, will provide a unique and authentic experience of Valencia. Taxis , buses , metro , bicycle hire and other transport are around. Valencia Cathedral - 0.44 km. Also known as the Metropolitan Cathedral, the "Basilica of the Assumption of Our Lady of Valencia" was consecrated in 1238 by the first bishop of Valencia. The old town is located in Valencia's city center close the river bed. The center presents the leisure and culture accumulation in the city. Beautiful and modern apartment in Valencia at Plaza Merced. The heart of the Old-town is the perfect location to explore the entire city.